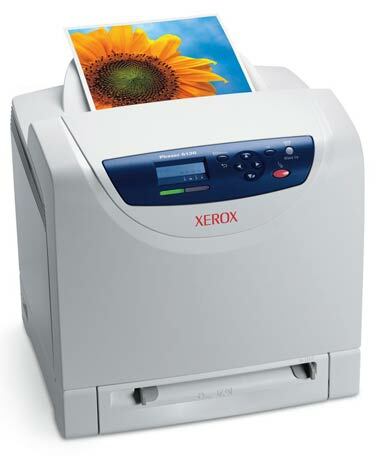 Xerox’s Phaser 6130 is a color laser printer designed for small workgroups or personal office use. At $449, the Phaser 6130 is a bargain, but in our testing, the Phaser 6130 was a subpar performer and color prints looked unappealing. In summary, for a less-than-average price, you get an average printer with the Phaser 6130. Setting up the color laser is simple. Weighing 37 pounds and measuring about 15 inches deep, the Phaser 6130 is relatively small compared to many laser printers; you should be able to set up this device safely without assistance. Once you lock the toner cartridges in place, all you have to do is connect the printer via USB or Ethernet, power it up, and insert the included software CD to install the printer driver. We tested the Phaser 6130’s speed over a 10/100 Base-T Ethernet connection, and the results weren’t impressive. It took 22 seconds to print a one-page Word document, 55 seconds to print a ten-page Word document, 2 minutes and 26 seconds to print a 22MB Photoshop image, and 1 minute to print a four-page PDF. Our top product in the color laser printer category took, respectively, 13 seconds, 29 seconds, 33 seconds, and 1 minute and 6 seconds to perform the same tests. The Phaser 6130 was also an average performer in terms of quality. Our panel of experts gave the printer’s color-photo quality a Fair rating because colors appeared very faint and the overall image lacked detail compared to our control photo of a picnic. The Phaser 6130 scored a Good rating in our Graphics, Fine Lines, and Gradients tests: We saw visible banding in gradients, fine lines looked bent, and graphics lacked detail overall. The Phaser 6130 was impressive only in its ability to print very clean, legible grayscale text. 15.3 x 15.51 x 15.75 in. Though the Phaser 6130 is inexpensive, there are better options in the same price range. For $50 more, you can buy Brother’s HL-4070CDW ( ), a much faster, higher quality color laser printer that includes wireless networking and duplexing.